From the kick off Hertford knew that Royston were a team that can score from anywhere with Rory collecting the high ball and running through the opposition to out sprint their entire back line. 5-0 the visitors. Hertford regrouped and used their big forwards to smash the Royston pack at the breakdown. Time after time they crossed the Royston line only to be battered backwards. This was a full blooded encounter. Eventually after a penalty at the breakdown the Hertford number 8 managed to snake over the line. Royston had their backs to the wall but Ben, Aurelien and Billy stood tall and reminded DPP selectors of their quality at the breakdown stealing and disrupting the bigger Hertford pack. The Royston scrum was solid with Josh P a cornerstone at tight head, Josh Wheatley and Edwin making up a compact front row. With Ashton and Cody adding the grunt from the second row, Hertford needed to rethink their forward orientated game plan. Their chance came from a wayward Royston clearance which enabled an effective backline attack against a broken Royston defensive line. 10-5 with no extra conversions added in the blustery conditions. Royston raised their game with some great hits going in from Big Owen and Matthew in the centre. With Mad Max Gage throwing himself at every Hertford player with 5 metres, the war of attrition continued and George on the other wing equalled the defensive masterclass. Luke's jinxy runs got us out of trouble on a number of occasions, putting us back on the front foot. Halftime saw Royston's finishers coming on to add fresh legs and grit to an epic first half. Straight into action Josh CE sat down the rampaging Hertford number 8 to let the opposition, and his team mates, know that he was well and truly back from his winter sabbatical. With the smiling assassin, Sammy B, now on the pitch Hertford got no change from their 'crash and go' game plan and Josh M provided fresh legs and determination at the break down. When they tried to go wide Joseph made one of the biggest hits of the season to remind the coaches of his developing skill set. 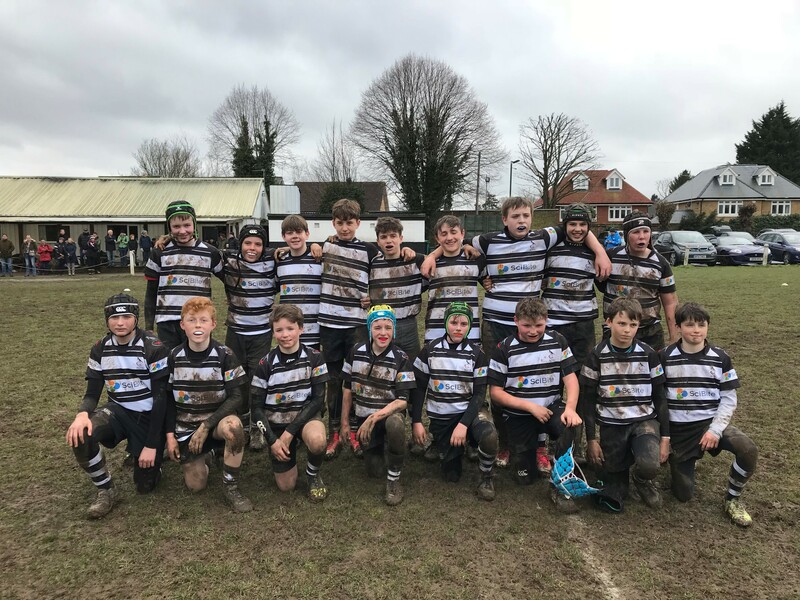 With penalties mounting against Royston at the breakdown Hertford saw their opportunity to use a driving maul from a line out to breach the Royston line. Royston now had their tales up with Toby coming on to add some more heart into the tiring pack. Phase after phase Royston pushed up the Hertford half with Sean using the Royston battering rams to move inch by inch towards the line. Rory not to be out done took a perfectly weighted pop pass to use his full 9 stone mass to break through 2 bigger defenders 15-10. Hertford looked shell shocked with the intensity of the Royston pack and a back line of such skill and vigour. Five minutes to go Royston were confident at getting another try.. the whistle blew for full time ... oh what could have been? Full credit to the squad for that performance which will spring board us to more success in the business end of the season!